Doctors may soon be giving pleural mesothelioma surgical patients a much clearer, more precise look at their future, replacing the often muddled, best-guess prognosis they have been providing. Researchers in Italy are developing a promising statistical model that will offer patients a more definitive understanding of their likely survival times. The model also could be used to improve the personalization of treatments. Even experienced doctors in the past have struggled to accurately predict survival time. Some pleural mesothelioma patients have survived three, four, five years or more after aggressive surgery, although the majority still live less than 12 months. Oncologists find it tough to explain why some defy the odds. 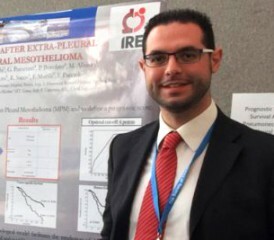 “This model may be useful to identify two different groups of [mesothelioma] cancer patients: Those with favorable prognoses and those with poor prognoses,” Leuzzi said. The Long-Term Survival Model (LTS) stemmed from a retrospective, multicenter study across Italy that included 468 pleural mesothelioma patients undergoing extrapleural pneumonectomy (EPP) surgery. A total of 107 patients (22.9 percent) lived at least three years after surgery and were classified as long term survivors. Similar factors in that group of patients were used to build the LTS statistical model. They had a lower median ratio between metastatic and resected lymph nodes. Researchers found no difference in those receiving multimodal therapy as opposed to those receiving only one type of treatment. The five, seven and 10 year survival rate for the LTS Group was 48.6 percent, 31.9 percent, and 22.6 percent, respectively. Leuzzi believes that by splitting surgical patients into either good or poor prognosis groups, it will help oncologists design better future clinical trials on adjuvant therapy. It also will help to identify which patients would be better suited for aggressive, follow-up surgery and closer scrutiny, eliminating others who would not benefit from a rigorous therapeutic approach.